Welcome to Friday, Folks. Part 3 of this series, just in time for the weekend. In part 1 of this series, we looked at the flexor digitorum longus muscle, and in part 2 the extensor digitorum longus. 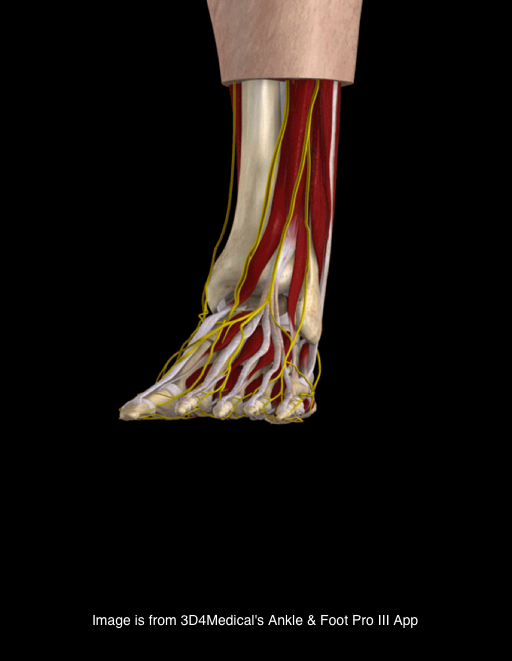 In part 3, we will look at some often overlooked muscles, the plantar lumbricals. Watch the video from the 1st post again. 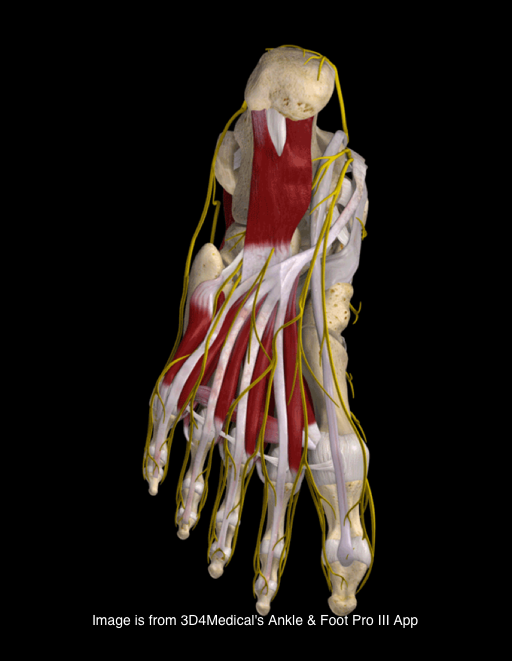 Note the flexion at the metatarsal phalangeal joint. The lumbricals of the foot attach proximally to the sides of adjacent tendons of the flexor digitorum longus (with the exception of the 1st, which only attaches to the medial side) and attach distally to the medial aspect of the head of the proximal phalynx; they then continue on to the extensor hoods in toes 2-5. Their open chain function (ie. the foot is off the ground) is described as flexion of the metatarsal phalangeal joint and extension of the proximal and distal interphalangeal joints. They also compress the metatarsal-phalangeal and inerpahlangeal joints, providing stability to the foot. There is also a small adductory moment to counteract abductory shear, due to the tendon passing medial to the metatarsal-phalangeal joints. The lumbricals are most active from midstance to preswing. That means they act predominantly in closed chain (or, when the foot is on the ground). Thinking along these lines, the lumbricals (along with the other intrinsic muscles of the foot) play a role in maintaining the medial longitudinal arch of the foot and stabilization of the forefoot during stance phase and rearfoot during preswing. Thinking now, as we are sure you are, in a closed chain fashion, from a distal to proximal orientation, they actually flex the metatarsal on the phalynx, assist in dorsiflexion of the ankle, and help to keep the toes from clawing from over recruitment of the flexor digitorum longus (which we say happen in last weeks post here). Now think about the changes which can occur with in the gait cycle due to dysfinction of this muscle. A shortened step length, diminished ankle rocker, increased forefoot rocker and premature heel rise. Now we will need increased extension at the metatarsophalangeal joints (particularly the 1st), shifting the tendon of the lumbricals upward and behind the transverse metatarsal joint axis, causing even more extension now at this joint. Chronically over time, this causes displacement of the fat pads anteriorly from under the metatarsal heads.How many patients have you seen with metatarsal head pain? What about the changes up the kinetic chain and the musculoskeletal implications of muscle inhibition, overfacilitation and joint dysfunction, often with neurological sequalae. Because of the lack of ankle dorsiflexion, you have less hip extension, so you borrow some from the lumbar spine, with increased compressive forces there and an increase in the lordosis, which causes an increase in the thoracic kyphosis and cervical lordosis. We need to get this leg up and forward to continue our progression ahead, so now we fire our hip flexors instead of the obliques. This further fuels inhibition of the glutes, compounding the loss of hip extension. How about a little increased shoulder flexion on the contralateral side to assist getting that leg forward? Don’t forget that we have altered the thoracic kyphosis and thus changed scapulo humeral mechanics. Neck/ shoulder pain from bad feet? Maybe. Look to the base; it is where many problems begin. Consider function in the context of where it occurs. Have and promote an adequate foot tripod. The Toe Wave is one step in the right direction. The Gait Guys….Foot Geeks….Gait Geeks…..Shoe Nerds……Yup. If you are reading this, then you are one of us now. Help us to spread the word…. all material copyright 2012 The Homunculus Group/The Gait Guys. All rights reserved. Don’t rip off our stuff! If you ask us nicely we will probably let you use it.